The skin rejuvenation procedure is characterized as a procedure that is done in attempt to reverse the visible signs of ageing. Skin rejuvenation processes can lessen wrinkles and lines and also firm loose and sagging areas of the skin leaving the skin with a younger appearance. What is skin rejuvenation and resurfacing? Static wrinkles: These wrinkles are noticeable at all the times and don't change in appearance with facial movements/expressions. Vascular conditions: Blood vessels noticeable on the surface of the skin, vascular injuries that show up as tiny blood-filled area also called spider veins or even a consistent flush of facial redness called rosacea. Laser skin rejuvenation is a sort of photo-rejuvenation treatment, non-obtrusive skin treatments where some kind of light is projected onto the area of skin treated. 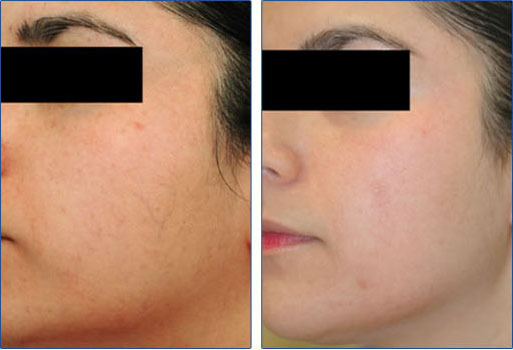 Other photo-rejuvenation treatments can be IPL (Intense Pulse Light) or IR (Infra Red) treatment. Laser skin rejuvenation is done by projecting laser light onto the skin imperfections to be treated. The energy delivered causes the pigmented cells to heat up and separate out and break these pigments substances which can also called melanin; then be ingested and disposed off by the cells in blood stream. The blemishes treated are generally found on the skin's surface, the "dermis", laser heats up sub skin tissues (the "epidermis"), this causes collagen production which contributes towards enhancing overall skin complexion. The accuracy of laser empowers doctors to direct beams very precisely. Diverse chromophores (the part of a molecule responsible of its color) are focused on while treating distinctive sorts of skin lesions, for instance hemoglobin chromospheres are focused on while disposing off vascular lesions while melanin chromophores are focused on when treating pigmented lesions. How safe is Laser Skin Rejuvenation? Since laser skin rejuvenation is very safe, so side effects are essentially insignificant and extremely rare. It is vital to experience such treatments at places known for their highly qualified staff and top quality gear. Selecting lower quality specialists or equipment may result in complications i.e scarring, burns changes in skin pigmentation and even bacterial infection.